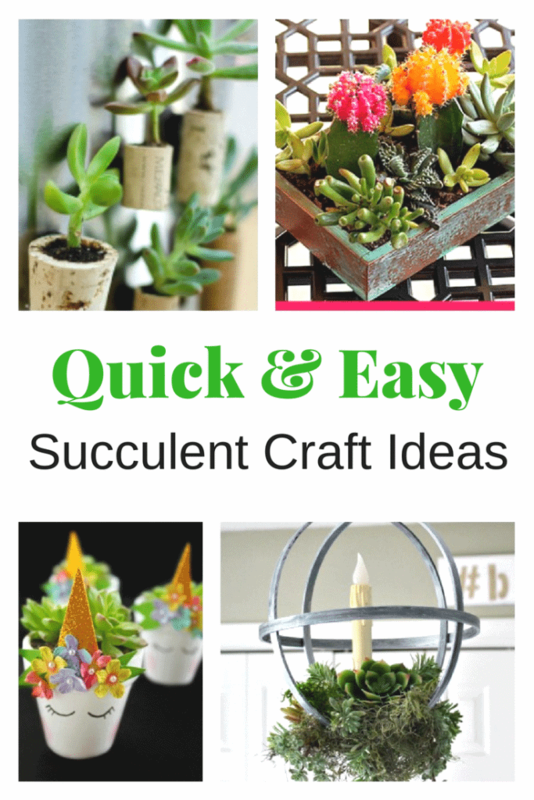 DIY Succulent Crafts – Fun succulent craft ideas for a perfect weekend project. As you all know, mom and I loved to craft and one of our favorites was making succulent gardens for home decor. Whether you are planning to use life succulents or faux succulents, one cannot argue with their beauty. Today we are sharing some fun succulent craft projects that are perfect for older kids or adults. 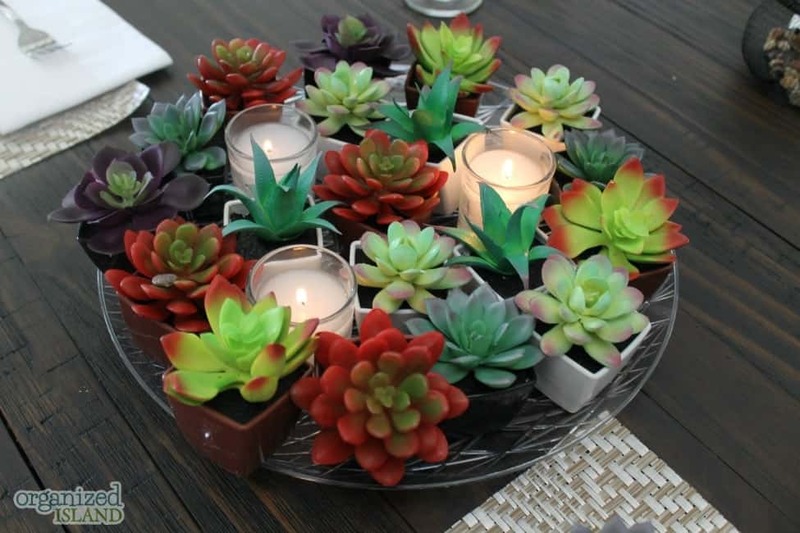 Succulent crafts make for fun and quick centerpiece or table setting decorations. Real succulents make for wonderful decoration and survive indoor conditions with minimal effort and care. I love that I do not have to water them as often because I tend to have a black thumb when it comes to gardening. The best potting soil for succulents is a well draining potting mix. Add extra sand, grit, or perlite (available at garden centers) to help drainage. Succulents don’t need a lot of water, but they should be watered at least once a week. Succulents are hearty, but still need some sunlight. Keep your succulents near the brightest window or brightest area of your home. Now grab a fun crafting partner or ten and enjoy making these succulent crafts. Be sure to tag us on social media if you make one of these! We would love to see your projects. Get beachy by planting your succulents in fun shells with A Bride on a Budget- these make an awesome keepsake! Create these easy and adorable Unicorn Succulent Plant Pots from Extreme Couponing Mom. Make a Glass Globe Succulent Terrarium with this tutorial from By Stephanie Lynn. You can use succulents to create this beautiful Living Succulent Wreath from Dukes and Duchesses. Get crafting with Faux Felt Succulents from Saved By Grace. Decorate with these dollar store faux succulent projects from yours truly. Put together this Upcycled Faux Copper Succulent Planter from Where the Smiles Have Been. Use some faux succulents to put together this One-Hour Succulent Arrangement from First Day of Home. These DIY Wine Cork Succulent Magnets from Our Crafty Mom are just adorable. For another fun upcycle, make this Succulent Mug Planter from My Pinterventures. Your succulents will look so cute in these Mason Jar Succulent Pots from Lolly Jane. You can craft or buy some faux succulents to make this beautiful Faux Succulent Vertical Hanging Wall Garden from Julie Measures. Upcycle candle jars for this DIY Window Succulent Garden from Suburbia Unwrapped. Here is a beautiful DIY Patio Table Succulent Garden from Mom Endeavors. I love these DIY Succulent Napkin Rings from Running With Sisters. Make your own Clay Faux Succulents with this easy air-dry version from Little Red Window. Here is a super easy Succulent Wreath from Pretty Providence. Use a letterpress drawer to make this awesome Vertical Succulent Garden from Dukes and Duchesses. I love the look of this Embroidery Hoop Succulent Planter from Our Crafty Mom. These Faux Succulent Monograms from The Crafting Chicks are so cute! Finally, check out this amazing Pallet Succulent Planter idea from The Urchin Collective. I do remember! I’ll never see succulent crafts and not think of your mom. I think they’re lovely. Aw thank you Tamara <3! Succulents (real or fake) are my fave. Lots of cute ideas! Visiting from Talk of the Town party. 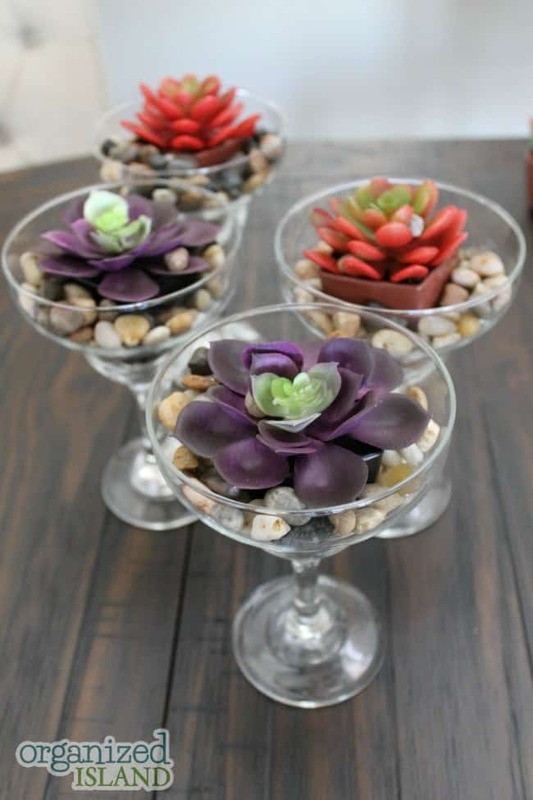 Love these succulent ideas! 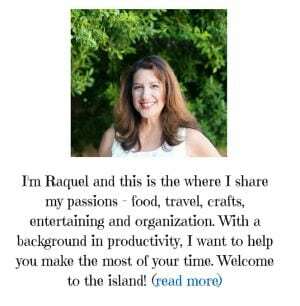 I will be featuring this at Merry Monday in my Get Crafty post. See you at the party.